Here at Product Display Solutions we offer large selection of clothing rack rectangular and round size dividers in a variety of size options at wholesale prices. 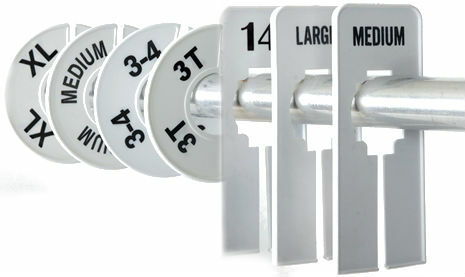 Our rectangular and round size dividers will help you organize your merchandise by size. Make sure your customers can find exactly the size they are looking for on your display racks with a size divider. If you can’t find what you are looking for please reach out to one of our sales associates by calling or emailing us.